Written by CMOS Bulletin SCMO on October 23, 2017 . Posted in Climate, Other, What's Current. Convenient Mistruths is a semi-fictional thriller, based on the very real possibility that offshore drilling in the Arctic could release large volumes of stored methane in the form of methane clathrates. If enhanced atmospheric methane concentrations push the climate system over a “tipping point”, it could be a disaster never seen before. Anticipating and averting this potential disaster provides an immediate sense of urgency to the action in this novel. This novel is neither polemical nor dull. The author has set out to entertain the reader, while making him or her aware of some of the serious scientific, moral and ethical issue that we face collectively in the guise of climate change. And this he does with exceptional brilliance and a flare for page-turning writing. The novel begins with a prologue, consisting of a series of five seemingly unconnected mini-stories, set in various locations around the world. Some take place in the past and exemplify the immediate human impacts of a changing climate, while others move the reader into a plausible but frightening future. Chapter 1 engages the reader’s interest and introduces two of the main characters, who are good friends, scientific colleagues and members of the International Panel on Climate Change (IPCC). Political boundaries are no constraint for these scientists, who share data on local atmospheric methane concentrations. Unusually and unexpectedly high concentrations of methane in the Russian Arctic near an oil and gas drilling site set off a chain of events that informs the rest of the action in this exciting novel. It involves rogue scientists, commercial avarice, international intrigue, hired villains with guns and unpredictable twists and turns. The author’s style is neither pedantic nor self-serving. He presumes an interested and intelligent reader, but he does not feel the need to explain every detail of the science. Nevertheless, he is not afraid to introduce important scientific concepts such as sea-level rise due to thermal expansion and ocean acidification due to dissolution of carbon dioxide. But this is not a pedagogical tome. In this novel, the science serves the development of the plot. And it is not hard to follow. 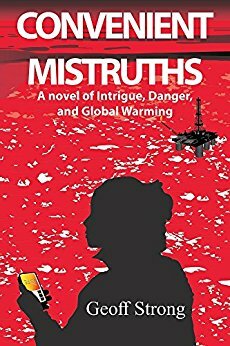 Convenient Mistruths is a compelling first novel by a former meteorologist and research scientist, now a climate change lecturer and advocate for protecting “planet Earth, the only planet available to us.” The transformation of the author from scientist into novelist is both remarkable and gratifying. I highly recommend this novel. It is a good read, exciting, gratifying and challenging. No technical background is required. It is accessible and enjoyable by all.